Why choose ekmPowershop for your first online shop? Quite simply because ekmPowershop is the quickest, simplest, easiest and most powerful way to setup your own online shop. 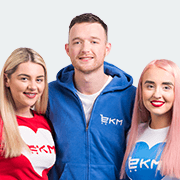 ekmPowershop has grown to become the UK’s number one hosted ecommerce solution and it’s no surprise why. We have no contract or minimum lease time which means you can cancel whenever you want. We will promote your online shop to all the major search engines and shopping directories. Our support team will advise you how to improve your online shop to maximise your sales. Our development team are always working on ekmPowershop and adding new features and functionality to your online shop to ensure it stays one step ahead of your competitors. Active Support means we will always be in close contact with you keeping you up to date with all the new tips and tricks in the world of ecommerce, marketing and online business. With ekmPowershop you effectively get a helping hand through the whole process of setting up your online business. As the UK’s number one hosted ecommerce solution we have a wide range of customers from bedroom based right up to large multi-nationals such as Lotus Cars, ITV, The BBC, PGA Golf, LivingTV and many more. ekmPowershop is a hosted ecommerce solution which means there is no software for you to install or configure. Everything is done and managed for you (upgrades, server maintenance, backups, etc...). All you need to take care of is adding your products and categories to the online shop and of course dealing with all your new customers and sales. Unlike many of our competitors we own and manage all our own servers and internet connectivity which means we have full control over our customer’s data. If your online shop is offline then you're losing sales therefore it pays dividends to ensure your online shop is hosted on the best platform possible... with ekmPowershop that is all taken care of. So again.... Why choose ekmPowershop? Quite simply because ekmPowershop is the quickest, simplest, easiest and most powerful way to setup your own online shop!